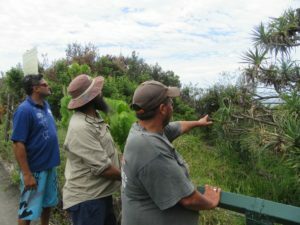 A stunning coastal icon of our headlands and dunes, the Pandanus, is the focus of a community conservation project to celebrate its cultural significance and to support its conservation on the Sunshine Coast. dieback mitigation expert, Joel Fostin. recent community information workshops. The impacts of the leafhopper pest and the mitigation measures needed to preserve this unique species have been the focus of workshops to save the Pandanus. The local Pandanus have developed crown rot, a condition which if left untreated, can kill the Pandanus and cause ‘dieback’ in populations. July. This is event is at Point Arkwright Lookout and Park, beach access number 85 from 9:30 to 10:30 AM. Go to http://coolumcoastcare.org.au/launch-of-pandanus-heritage-booklet/ to download the booklet.